Lanzarote: an insular, liminal place that is culturally a fragment of Europe in the Atlantic Ocean, just off the shores of the African continent, a volcanic island that has, despite its long isolation and scarcity of means, experienced surprising resurgences and discovered unexpected forms of settlement, agronomic practices, aesthetic concepts and far-sighted inspirational policies. Every year the Scientific Committee of the Fondazione Benetton Studi Ricerche awards the International Carlo Scarpa Prize for Gardens to a place that is particularly dense in natural values, memory and invention. This year it has chosen to dedicate the campaign of studies, care and dissemination linked to the 28th edition of Prize to the Jardín de Cactus. Inaugurated on 17 March 1990 near Guatiza in the north-eastern corner of Lanzarote, this little garden belongs to a unique system of cultivated quarries and craters embodying the fertile equilibrium between nature and culture existing on the island.. The Guatiza quarry is one of the most important projects to be created by artist César Manrique (1919-1992) for his native island of Lanzarote. He did so using the traditional techniques of the island and its people, including terracing, spreading layers of volcanic soil, constructing windbreaks and, in this case, cultivating a collection of thousands of cacti forming a spectacular display for the joy of both locals and visitors to the island. 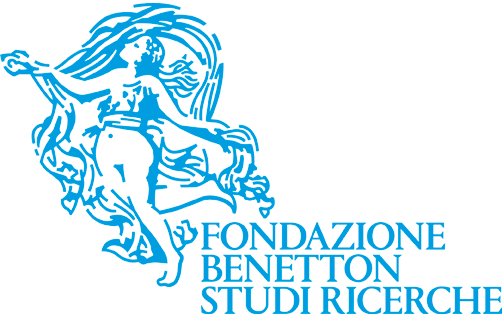 The ceremony will be introduced and coordinated by Luigi Latini (president of the Fondazione Benetton Scientific Committee). 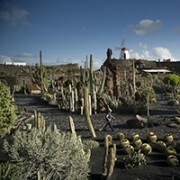 It will include the screening of the Foundation’s documentary film Lanzarote, Jardín de Cactus. 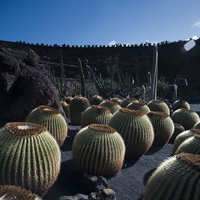 Premio Internazionale Carlo Scarpa per il Giardino 2017 (Lanzarote, Jardín de Cactus. 2017 Carlo Scarpa Prize for Gardens) directed by Ziyah Gafic, the reading of the Prize Motivation by Patrizia Boschiero, and the handing-over of the seal designed by Carlo Scarpa to Antonio Martín Santos, gardener of the Jardín de Cactus, in recognition of his commitment and care for the award-winning site. This part of the ceremony will be followed by speeches by representatives of various public and cultural institutions – in particular, the Cabildo de Lanzarote and the Gobierno de Canarias. The ceremony will conclude with contributions by Marco Tamaro, director of the Fondazione Benetton, by Juan Manuel Palerm Salazar, president of Uniscape, and by representatives of both local and national institutions. The ceremony will conclude with music from the Canary Islands, with Benito Cabrera and his quartet (bass, timple, percussion, guitar), followed by a toast. Also available at the ceremony Lanzarote, Jardín de Cactus, the book dedicated to the designated site of the 2017 Carlo Scarpa Prize; edited by Patrizia Boschiero, Luigi Latini, and Juan Manuel Palerm Salazar, it is published by the Fondazione Benetton in Italian and English. The 28th Carlo Scarpa Prize awareness-raising campaign will continue with other public initiatives during the course of the year, focussing in particular on Spain, Madrid and Lanzarote. Ministero dei Beni e delle Attività Culturali e del Turismo, Italy; Regione del Veneto; Città di Treviso.